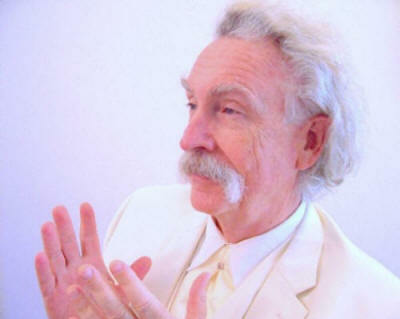 Mark Twain is portrayed by Rod Rawlings. 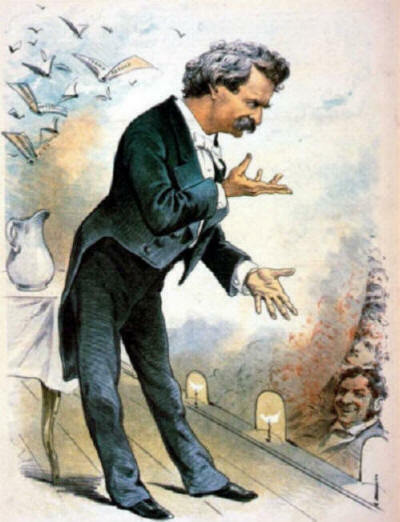 Read quotes by and about Mark Twain. 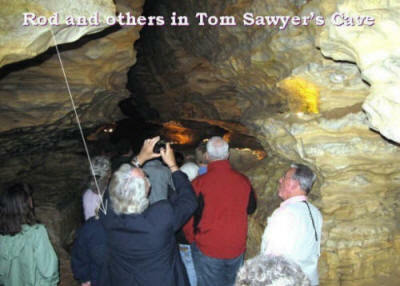 See videos of and about Mark Twain. 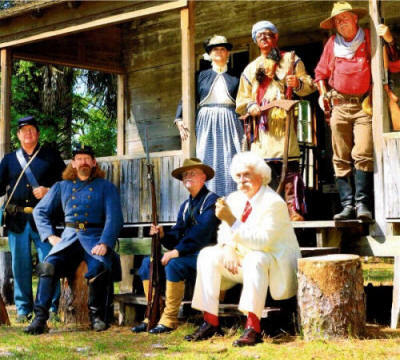 Have a Mark Twain performance at your theatre, business, school, home or group. 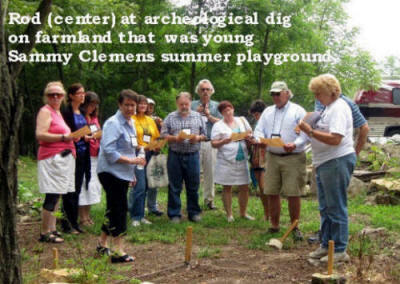 See videos, hear narrations, read quotes, and have a live performance of Mark Twain at your theater, business, school, home or group. 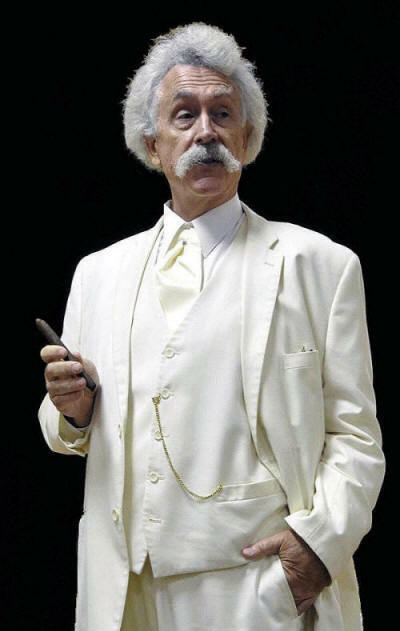 Mark Twain would have a hard time calling Rod Rawlings' bluff. He's got all the right moves, the right looks and the right attitude. Fuzzy-white unkempt hair? Check. Fuzzy-white unkempt moustache? Check. Tailored ivory suit? Check. Red socks? Check. Corncob pipe? Check. Tight-lipped smirk and slow, deliberate speech pattern? Check. 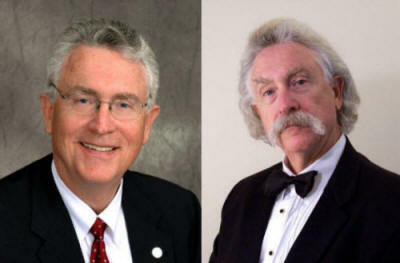 As far as Twain impersonators go, Rawlings is a dead ringer. Just being in his company can make you feel like you're dangling your feet in the Mississippi River, watching a steamboat chug out of sight. Maybe it's his low voice. It has a calming effect. "People in their 50s and older have no trouble recognizing me," Rawlings says. "Some of the younger ones, when they see me, they know I'm one of those dead writers whose books they had to read in school. Or they mistake me for Einstein." 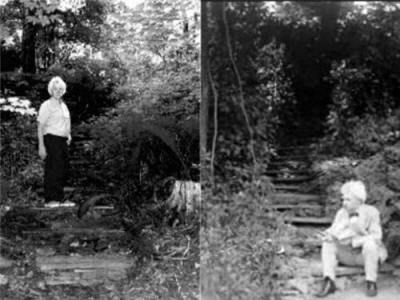 If you've ever adventured with Huck Finn or Tom Sawyer, you'd never mistake Twain for Einstein. A real-estate broker by trade, Rawlings is sitting stoically under a canopy of imposing oaks at Marie Selby Botanical Gardens. As anticipated, he's dressed in full Twain regalia, down to the suspenders holding up his Italian-made britches. His hair, he reveals, is naturally brown. He started dying it two years ago when he decided to embody the famous author and humorist at the peak of his celebrity: age 70. "I found out late in life that I really like acting. And, to my surprise, I'm good at it. I thought if this is what I'm going to do, I don't have a lot of time to do it." He scans the open lawn, where a few Christmases ago he once stood as a 10-foot-tall oak tree named Obadiah Oak during Selby Gardens' Festival of Lights. 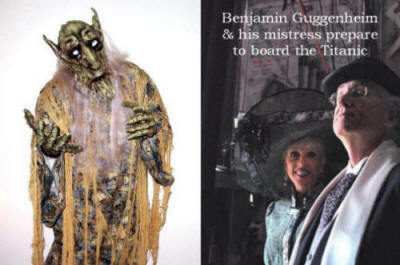 It was around the same time that he landed his first stage role as Benjamin Guggenheim in The Players Theatre's Titanic: The Musical. "I'm Medicare age, he continues. "It's too late to be a general-purpose actor, so I decided to specialize." 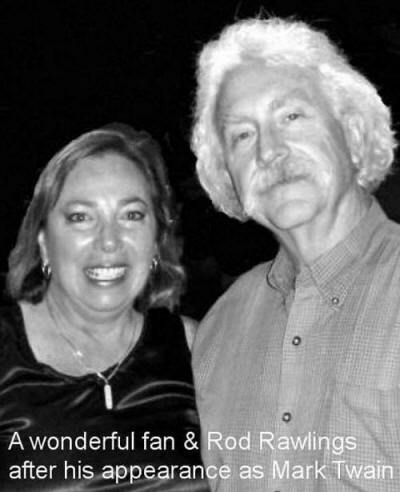 He chose Twain because the writer has an endless vault of material from which to pull: hundreds of stories and witticisms that Rawlings has cherished since he was a little boy. Of course, it helped that he looked like the writer after he ditched his glasses and grew a white horseshoe moustache. "Here's what I looked like when I was Rod Rawlings," he says, presenting a business card for Action Team Real Estate. On the card is an image of a clean-cut real-estate broker in a black suit coat and tie. "It's just hair," he shrugs. "I'm on my third hairdresser. The first two just couldn't get the color right." The undertaking has been nothing short of a transformation. To prepare for the role, he hired former Broadway director Bob D'Angelo. 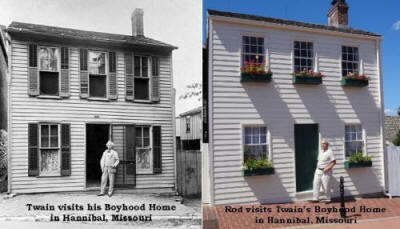 He traveled to Twain's home in Hartford, Connecticut, and to his hometown of Hannibal, Missouri, the small riverside town that served as the setting for many of his most famous stories. He read and re-read stacks of the author's books and articles. He memorized quotes and passages, mastering Twain's sentence structure and ponderously slow delivery. He assumed his mannerisms. (Twain rarely smiled with his teeth.) He brushed up on his trivia. (Twain smoked 40 cigars a day.) And he engrossed himself in the author's attitude. 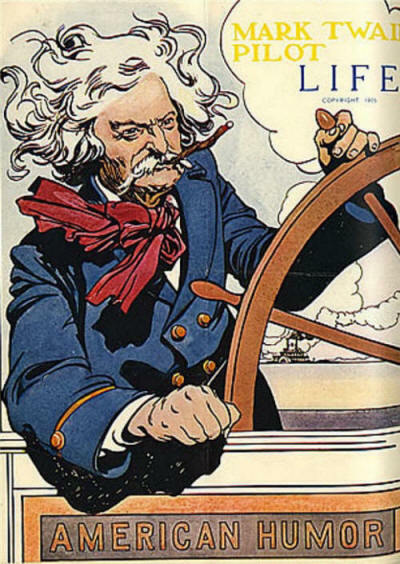 (Twain held a grudge and loved revenge.) 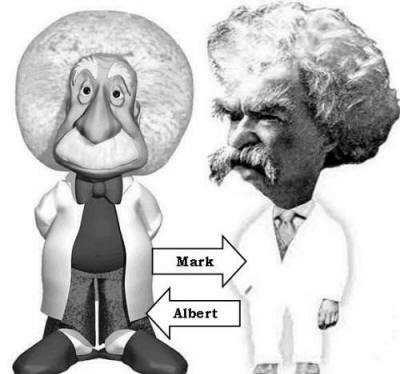 He spent hours digesting the research of countless Twain scholars and in the process learned that he and Twain have a lot in common besides a hairline. To test-market his act, he performed a 90-minute bit at a Manatee County Library in front of a small gathering of people. Part performance art, part monologue, Rawlings strummed his guitar and sang songs, as Twain once did on the eve of his 70th birthday. "I knew it was a success because people laughed and nobody left," Rawlings says. "Some people even wanted pictures with me when I was through." A former hospital administrator and Vietnam War veteran, Rawlings says he's just beginning the third act of his life. "Act One is: You do what you're told," he says. "Act Two is: You do what you must. Act Three is: You do what you like." The father of two daughters, Rawlings moved to Florida with his family as a teenager. After serving two tours in Vietnam, he studied journalism at the University of Maryland and later worked as a reporter for a business newspaper in California. A voice actor, he produced a nationally syndicated radio program that ran for a year-and-a-half leading up to the 1984 summer Olympics in Los Angeles. And as a fundraising consultant, he helped pad the coffers of many big nonprofit organizations. "Twain was always trying to get rich, but he didn't care much for money," Rawlings says. "He wasn't good at taking orders and he was always steering his own course." 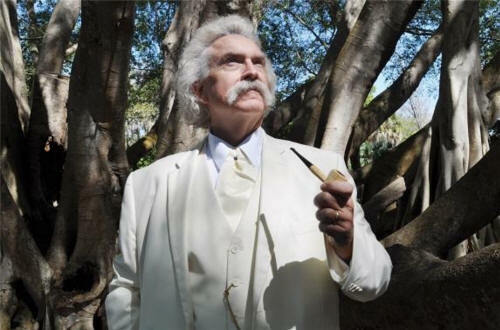 Not that he hasn't already created a little stir at Selby Gardens, as curious visitors make their way to his table to ask Twain for advice and hard-earned wisdom. Rawlings obliges, spilling forth with timeless quips until his fans smile and thank him for the commentary. 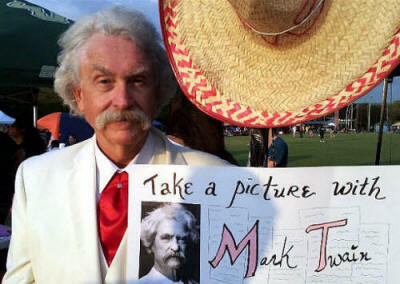 He says of Twain, "The guy has been dead over 100 years and we're still talking about him. It's like what Thomas Edison once said: 'The average American loves his family and if he has any love left over, it's generally saved for Mark Twain.'" business, school, home or group.